Digital marketing continues to be an essential element of many successful law firm strategies. For example, Electronic Newsletters (Enewsletters or Enews) are constantly evolving; however, many law firms are still not keeping up with technology changes and best practices. Enewsletters must allow you to integrated social media (Facebook, Pinterest, Twitter, etc.) and also allow you to drive traffic to your website, blog and landing pages. Enewsletters must be smart device friendly and mobile compatible. More than a billion people primarily access the Web and email from mobile devices. 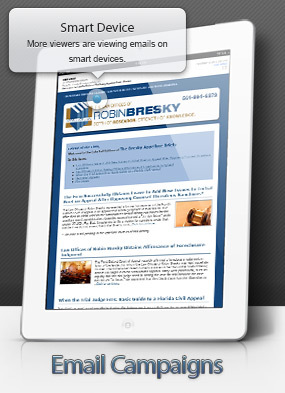 Your newsletter must be responsive and display well on all platforms including, desktops, tablets, and smart phones. Enewsletters must comply with Anti-Spam and the U.S. CAN-SPAM Act rules. Most email campaign providers are required to enforce spam laws, not only for legal reasons, but because spam negatively impacts deliverability rates. Most have some very strict rules that must be adhered to, including an unsubscribe link option. Enewsletters must allow for sharing. Encourage your readers to share and forward your Enewsletters to their contacts. Also provide the new reader with an opportunity to easily subscribe to your Enewsletter. Enewsletters must be delivered at the right time and right interval for better open rates. Depending on the recipient (prospects, businesses, lawyer, etc.) this can vary as to the actual day and time you distribute. It may take some time and testing to hone in on your best delivery times. Enewsletters must have a link to an HTML version. Some users may have older email clients that may not allow them to display your Enewsletter, so this will allow to them view it. Also, HTML versions allow readers to link to you website or social sites. Best Practice Enewsletters – Get Started Today!